An implanted port with needle assembly inserted. A fibrin sheath of central venous catheter (including PICC-lines and implanted ports) can be suspected when it is possible to infuse into it but not to aspirate. Fibrin sheaths are usually detected by fluoroscopic catheter contrast angiography. X-ray of central venous catheters is enough to check position after insertion, or in suspected movement. A suspicion of a thrombotic occlusion of the vein passed by the catheter indicates a CT angiography. Ability to aspirate from the catheter can optionally be tested. Contrast should be non-ionic, with an iodine concentration of at least 270 mg/ml. Syringe can be for example 10 ml or 20 ml, for injection by hand. For pumps in ports, the pressure should not exceed >40psi (275kPa or 2,75bar). For ports, the needle should be at least 20G (0.9mm), and needs to be designed for port use (to avoid fragmentation of the port membrane). It should be connected by luer taper. The system needs to be closed to air at all times. The procedure is preferably done in medical gloves, which do not need to be sterile. The total amount of contrast is rather small (5-15ml) so a decreased renal function does not need to to be a contraindication. For ports, it should include a lateral projection to confirm that the needle is in proper place before contrast infusion. Posteroanterior projection, or slightly oblique to avoid superimposing the spine. Optionally, check if it is possible to aspirate from the catheter. For ports, first inject a small amount of contrast to and image when contrast fills the port chamber and the catheter, to exclude malfunction. Imaging of the outflow from the catheter is done at 10-15[notes 2] images per second. Flush with 20 - 30 ml normal saline. Optionally, quantify the amount of infused contrast. Optimal central venous catheter tip location. The distal tip of jugular catheters should lie in the lower part of the superior vena cava. For left-sides catheters, a tip in the upper right atrium has also been suggested. However, the cardiac silhouettes are regarded as not reliable for this purpose, compared to using the carina as a landmark. Hence, a catheter tip between 55 and 30 mm below the level of the carina is regarded as acceptable placement on anteroposterior X-rays. The tip of nontunneled jugular hemodialysis catheters should be in the superior vena cava, and not in the right atrium. 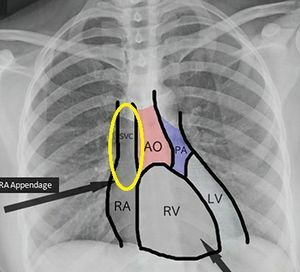 The tip of high-flow tunneled hemodialysis catheters should be within the right upper atrium. For catheters positioned to low or high, estimate the difference between the current and optimal placement. In a normal case, the contrast flows straight out from the catheter. Contrast flowing at a skewed angle compared to the catheter is regarded to be a suspected fibrin sheath. A definite fibrin sheath is visualized as contrast flowing backwards around the catheter, looking like a thickening of the distal part, before exiting at a more proximal part of the catheter. The fibrin sheath is indirectly seen in these images before and after radiocontrast infusion, as the radiocontrast collects around the catheter. Presence or absence of fibrin sheath. The pattern of the outflow may be described. ↑ A frequency of 2-4 images per second has also been suggested (Knutstad, 2016), which confers a lower radiation dose but makes it more difficult to determine the dynamic flow of contrast. ↑ 1.0 1.1 1.2 1.3 Knutstad, K.; Hager, B.; Hauser, M. (2016). "Radiologic diagnosis and management of complications related to central venous access ". Acta Radiologica 44 (5): 508–516. doi:10.1080/j.1600-0455.2003.00115.x. ISSN 0284-1851. ↑ 2.00 2.01 2.02 2.03 2.04 2.05 2.06 2.07 2.08 2.09 2.10 2.11 2.12 2.13 . Porta-a-cath control. Röntgen Metodbok, Radiology Department of Helsingborg. Retrieved on 2018-07-25. ↑ 3.0 3.1 3.2 Mark P Androes, Alan C Heffner. Placement of jugular venous catheters. UpToDate. This topic last updated: Apr 24, 2018. ↑ Venugopal, AchuthanNair; Koshy, RachelCherian; Koshy, SumodM (2013). "Role of chest X-ray in citing central venous catheter tip: A few case reports with a brief review of the literature ". Journal of Anaesthesiology Clinical Pharmacology 29 (3): 397–400. doi:10.4103/0970-9185.117114. ISSN 0970-9185. PMID 24106371. ↑ 5.0 5.1 Steven J Bander, Karen Woo. Central catheters for acute and chronic hemodialysis access. UpToDate. This topic last updated: Mar 27, 2018.